Air Plants (Tillandsia) are a type of Bromeliad that grows without soil. They receive all water and nutrients from the air through their specialized leaves. Unlike most other plants, their roots are not used for absorbing water and nutrients but serve only as anchors for attachment. Air Plants are easy to care for, make unique houseplants and are ideal for placement in terrariums. Air Plants grow best in a bright room with sunlight coming in the window at least four hours a day. Do not place your Air Plant in direct sunlight, it is too warm. Plants should be in an open area with good air circulation. These plants crave daily air misting and appreciate a good soaking once a week. To air mist, spritz some water in the general area near your plant. You are simply wetting the atmosphere around your plant and not spraying water directly on the foliage. Another way to increase the humidity is to place a decorative saucer of gravel or shells around the plant area and keep the saucers filled with water. Or you can skip misting and pebble-filled saucers and place your plant in the bathroom – an ideal humid atmosphere for Air Plants. Air plants have a life cycle of one plant growing to maturity and blooming. Before, during or after the blooming (depending on the species) the plant will start producing young ‘pups’. Most Air Plants produce between two and eight pups that will mature, and in-turn bloom and produce pups the following year. So this year you have one plant, next year maybe 4 plants, the next year 12 plants and so on. 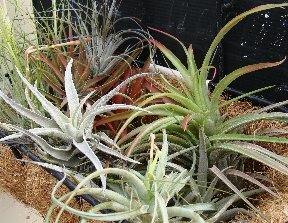 Your Air Plant will look better next year than this year as it starts to clump and produce more blooms. Each plant only flowers once in its lifetime, but you should have blooms each year as the pups mature and flower. 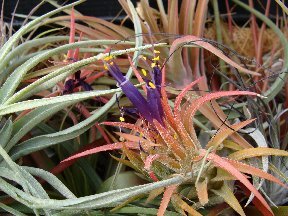 Flowers may last several days to many months, depending on the species, but most Air Plants bloom naturally in late-winter through mid-summer. Air Plants can be grown basically anywhere – except in soil. Do not place your plant in anything that holds water of moisture as it needs to dry out between waterings. Use glue, wire, fishing line, twisty ties or staples to mount your Air Plant. You can adhere it to a decorative stone, seashell or pottery: attach it to a magnet, Velcro it on a mirror or put it in a terrarium. If you are not sure where to mount your Air Plant – don’t, it will remain just as happy sitting on your countertop.